Hey, I don’t know if I’ve mentioned this a zillion times already, but I wrote a book . It’s coming out in May, but if you are one of 10 people my random number generator deems worthy, my publisher will send you an advance galley copy. A galley is a copy of the book printed before all the proofreading is complete. It’s usually sent to critics and magazine writers so they have time to write a book review before the publication date. However, we’re also sending 10 copies to my lovely, blog readers! You can be the first kid on your block to read my book, AND you’ll gain deep insight into my psyche by examining my inability to hyphenate properly. To enter, sign up for my email list here. That’s it. You don’t have to leave a comment on this entry, just sign up for the list and be sure to click on the link in the confirmation e-mail to finish the subscription process. 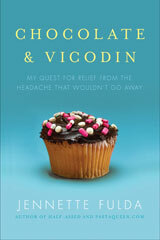 You’ll get a free muffin recipe regardless and you’ll also get any news related to the book sent to your inbox. I promise not to sell or give your e-mail to anyone, nor will I barter it for low-fat cupcakes. I also promise not to spam you or try to sell you Viagra. On Monday, March 3rd, I will randomly pick 10 members of the list as winners. So, if you sign up for the list and then unsubscribe two minutes later, you will not be included in the drawing. You can always unsubscribe at any time you wish, though I have no idea why you’d want to do that, even if someone baked you a dozen low-fat cupcakes. I would also be really, really, grateful if you wrote a review of the book on Amazon/your blog/MySpace/Facebook/in the dirt on your windshield. Share the love! Get the word out! Just don’t spoil the ending! Oh, okay, you can spoil the ending. I lose the weight. Sorry to ruin it for you. ETA: I forgot to mention this, but sadly the contest is only open to residents of the US and Canada. Sorry! 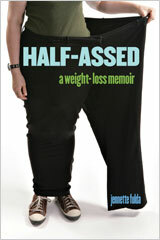 I have also set up an official web site for the book at halfassedbook.com (I wrote a half-assed book! I am a half-assed author! I have a half-assed site! How many half-assed jokes can I make?) From now on, I’ll be posting most of the book-related news over there, but I’ll also cross-post entries that are relevant here too. I don’t want to deluge people with book info unless they’re interested in it. I’m also writing a series of posts called “Blog to Book” over there which will chronicle the process of writing a book based on a blog. And while we’re at it, I set up a Facebook group you can join too! I also have two poll questions for you. First, I don’t know if I’ve mentioned this a zillion times already, but I’m running the Indianapolis 500 Mini-Marathon on Saturday, May 3rd. I want to have a book-release party the night before the race where we can all meet-up and carbo-load together. You don’t have to run the race to eat the carbs. I need to know how many people would show up so I can figure out where to hold it. If you think you would attend a book release party in Indianapolis (probably downtown, but that’s negotiable) on the evening of Friday, May 2, 2008, please respond to the poll below. You bring yourself and I’ll bring my fat pants! Second question: I will be ordering books to sell and personally sign at the book release party. I’m going to sell autographed copies of the book on my web site too. I need to know how many to order so I’m not also selling them out of the back of my trunk for the next 10 years. If you’ve already pre-ordered the book from Amazon, you can cancel your order any time before it is actually shipped and your credit card will not be charged. Would you buy an autographed copy of the book from me? You would have to pay shipping and handling costs and I’d probably sell it at or slightly above the suggested retail price ($15.95) since I have to take the time and effort to run the whole business off of my kitchen counter. I do not know if you would get the book before or after it is available in stores. Just know that I would ship it as soon as I could. Please let me know if you’re interested via the poll below. ETA: I WILL ship books overseas if you pay for the shipping costs. If you are using an RSS reader to read this entry, you’ll probably need to visit the blog to actually see the polls. If for some reason you still can’t see the polls, visit them here. Thanks! And don’t forget to sign up for the email list for your chance to win an advance copy! Earlier: A whole year of half of me, omnivore Q’s, and Wilma, where are you? I’m out of town for a wedding May 2, or I’d be there. Will you be autographing in person any other time? I’d like an autographed copy, but I’d also like to meet you! I’m scheduling readings in Indy, Louisville, Lexington, KY, and hopefully Chicago too. Also, one in South Bend since I have a friend there. Once they are all confirmed, I’ll post them on the book site. I’m SO excited about your book coming out!! YAY :). I totally abuse the whole … concept. I’m addicted, I can’t stop! I have a question for you that is entirely unrelated to this post (though if you want to fly me in from Baltimore, I will totally come to your party!). Anyway: Shoes. I am sure you’ve probably posted about this before, but I can’t find anything. What running shoes do you like? I am just starting to jog (very, very slowly, since I am 340lb) in small intervals and I have been spending a lot of time on the treadmill of late, mostly walking, but with some spurts of jogging thrown in. Any opinions that you have would be most appreciated. PQ – Well, it’s really best to go to a running store and get fitted for the shoes that are appropriate for your gait. That being said, I’ve always liked New Balance and Saucony brand shoes. Really, you should get something that feels comfortable to you. I’d like to offer to review your book, but I doubt my site gets enough traffic to make it worth your while. But I can assure you, my mother would be *very* interested in hearing about it. But then she might just borrow it. Blurgh. You crack me up! I absolutely look forward to reading your blog everyday! If your book is 1/2 as good as your daily posts…you’re going to make it BIG girl! Looking forward to the book very much! I would love to attend the book launch party, but I scheduled a race for May 4, so I think that would be a tough schedule. I signed up for the email list and will definitely watch your tour schedule for a date when I can make it. I know you’re choosing advance copy winners randomly, but I love to write book reviews and would especially love to review one of yours. I have my fingers crossed (which makes it hard to bake muffins). Would you ship the autographed copies overseas? PQ – Yes, I will, but you would have to pay for the shipping costs. I don’t know how much that would be, but I’d find some way to calculate it before you purchase. I just recommended your site to a friend who was struggling with her weight loss for some inspiration, I told her to go to the archives and start from your first blog and continue to present date. It’s been a good two years since I have been reading your blog, so I took a peek too, and damn, you are one funny girl. The early blogs had me laughing out loud – at my desk. I really enjoy your writing and so looking forward to the book. Rock on! You must be excited that it’s getting closer and closer to release! I was thinking of you in the grocery store the other day when I picked up a fruit I’d never seen to try. It was called a “Grapple”. The package said it was a grape/apple hybrid. It did smell strongly of grape, but looked and tasted like apple. I wouldn’t pay the extra $$ for them again, but I will sniff them anytime I see them. I’ll sign up and even if I don’t win, I’m buying a copy. because yes – I think you’re awesome. PQ – Aw. *blushes* You’re sweet. I’m going to buy your book, so I may as well get an autographed copy! I’m so happy for you. I would come to the party if I were on the right continent… but as it is, I hope it goes with a swing! I’ve ordered your book from Amazon and am trying to be patient as I wait for the release date and the time it will take to ship to Oz. PQ – LOL! I hadn’t thought about it, but if my book is ever released in Britain or Australia they might have to re-title it “Half-Arsed.” Hee! PQ – I WILL stand in line at the post office to ship autographed copies to Australia. Sadly though, the galley contest is only open to US and Canadian residents. Sorry! I doubt I’ll be traveling, but I would absolutely buy an autographed copy. Well, maybe not absolutely. It runs more than $20-$25 and I probably won’t. I have never commented before but I have been greatly enjoying, and drawing inspiration from, your blog for months now. I would love to buy an autographed copy of your book. I live in Canada though, and sometimes the shipping costs seem ridiculous! I would totally be there if it weren’t held on the weekend before finals! Especially since Indy is within spitting distance from me. I can’t wait until your book comes out, and I’m glad I’m such a procrastinator and didn’t reserve the copy before, because I would really like an autographed copy. And hell YEAH I would go to your release party! I would love to participate, but it wouldn’t be fair since I work for your publisher! Plus, I’ve already read the galley. I love your book. I’ve recommended it to lots and lots of people. Do you think you’d do any future book tour dates outside of the Indianapolis area? I know asking you to come out to California would be a stretch, but I bet you’d have quite a following. Plus, think about all the fun sites you could see. I ordered a copy of the book on Amazon, but would be very interested in getting an autographed copy. I’ll follow your new book website to find out more details on how to get the book directly from you. PQ – I would love to visit California, and I might be out there for the BlogHer conference in July. We’ll see. I’ll be sure to post about it if I schedule anything out there. PQ – I wouldn’t delete you! I want people to sign up for the mailing list, even if they aren’t eligible to win the galley copy. If you want to unsubscribe, that’s cool, but I wouldn’t kick you off my list. I think having the book party before the race is brilliant! I am running it, as I hope you will recall (I know it’s tough to keep up with all your fans =) but I am also staying with my niece-in-law, who lives in Carmel and is also running the race. I am going to email her and explain that Friday night I will be spending with my internet friend who wrote a book, and hopefully she will be cool with that. I also have to clear it with my hubby. BUT, girl, I am going to do all I can to make it to your party. I will be honored to be there. Oh, and I’m sure we won’t be racing that Half any where near each other. You have been smoking me on your min/mile times. I’m still in the mid 11 minutes for long distances. I hear, though, that the Indy Half is shoulder to shoulder the majority of the race, so we’d probably lose each other in the crowds anyway. So meeting you at your book party will at least guarantee me a chance to meet you, even if it’s not at the race. Cool bananas, I’m not being kicked off the list. Woo hoo for PQ! PQ, I would definitely go to a Chicago reading!!! BTW, you got a great review in Kirkus, which is what lead me to your site! I’m a librarian in a suburban public library, and I’ve put in a purchase order to add your book to the collection. Spread the luv, PQ! Anytime you’re in Boston again (for a signing or something else), we’ll do lunch or at least a cup of coffee!